I recently took a quick, weekend trip to San Francisco, California. We crammed so much into the short trip, that I don't think anyone would believe it was only 3 days of activities. Our first day was spent getting the lay of the land, exploring our surroundings, wetting our feet with all the food options available. Our second day, we spent 7 hours doing a self-guided walking tour of all of the main neighborhoods and sites. The walking tour turned out to be the single most valuable activity that we did. I feel like we saw nearly everything! I left San Francisco feeling like I understood the heart of the city, what makes it so great and why people love it so. In this guide, you'll find details of where to stay, where to eat, what neighborhoods to visit, the main attractions, and our exact walking tour. This guide is perfect for first-time visitors! 1. ALWAYS bring an umbrella. I'm serious. Stick it in your purse every single time you head out, even if the sun is shining. We bought umbrellas on TWO different occasions after forgetting to bring the umbrella we bought the previous day. 2. Uber is not always the most efficient way to get around- in fact, we found Uber to be slow, inefficient, and really expensive. Instead, I would suggest to walk when possible, and take the BART when it's convenient. Use Uber as a last resort rather than a first- we spent way too much time in Ubers on our first evening there- and got dropped off at an entirely wrong location. 3. Bring a jacket every time you go out- even it feels warm and looks sunny..it will get colder and you will be freezing. I made this mistake on the first night and did not make it again. Whenever we travel, my preference is always to stay in a smaller boutique hotel. I love the uniqueness, coziness, and service at these hotels. We stayed in this stylish, boutique hotel right next to Union Square called Hotel Zelos. I highly recommend staying here! The location was fabulous, we were close to every activity we wanted to do. Also, Union Square is a short commute to most of the must-see neighborhoods an sites of San Francisco. Across the street from our hotel, we had Macy's and Forever 21, and right next door there was a Trader Joe's. Our room was huge, and there was a fun, trendy hotel bar called Dirty Habit where we enjoyed dinner and delicious cocktails one night. The staff at the hotel were all really lovely and helpful, and for San Francisco, the rates here are super reasonable. In some cities, we like to stay in touristy areas and in some cities we do not. For San Francisco, I read multiple articles encouraging visitors to stay downtown near Union Square or Fisherman's Wharf to be close to the action and the places you'll want to visit. I recommend this approach too, commutes can be lengthy in San Francisco to get to one neighborhood or another and I cannot imagine staying further out or staying outside of the downtown area. We stopped at Tartine for an afternoon pick me up on our first day in town. I recommend the sandwiches (which we didn't order but looked good) and maybe a pastry. Mama's was on almost every list I found about San Francisco, and after eating there, I can easily see why. We had the MOST amazing brunch here. We waited 2 hours in the line (they don't take reservations) and it was cold and rainy outside. We persevered though, and we both agreed it was worth it. Our meals were BOMB, I ordered the Monte Cristo (a french toast like turkey and gruyere sandwhich that is meant to be dipped in homemade rasberry jam) and Paul ordered the North Shore Omelette. We also shared the Eggs Benedict. Of those three, make sure at least one of you orders the Monte Cristo. It was overwhelming how good the food was here. Wait it out. That is the best advice I can give you. The staff is really nice and helpful here and they are happy to point you in the right direction. Ask for recommendations and follow them! Chinatown was a part of our walking tour and it was full of fun things to see, do and experience. It's a bustling neighborhood so prepare yourself for that. Also, make sure to eat at least something in this neighborhood, we stopped in a restaurant for an afternoon "snack" but it quickly turned into a full meal. It was unique Chinese food that we aren't quite used to, but delicious nonetheless. Hops & Hominy was definitely a last minute dinner decision for us. We showed up on Saturday night without a reservation and were able to get seats at the bar within minutes. It was really cool inside, and the food and drinks at the bar were extremely satisfying. We shared a few different things and were so happy that we stumbled upon this place. It's definitely a great addition to any San Francisco itinerary. The Farmers Market is only on certain days (we happened to catch it on a Saturday) and it did not disappoint. There was live music and so much going on! It was jam packed full of people, food, flowers and fun artisanal things to buy. We shared a plate at the Taco/ Mexican stand with a really long line (obviously a good sign). The food was really good and not too expensive. We really loved the scene here, and we easily could have spent a few more hours listening to the music and people watching, but we had to keep it moving on our walking tour. Boudin Bakery was a perfect pit stop on our tour. We split one Sourdough bread bowl with New England Clam Chowder. We were on a tight itinerary so opted out, but I've heard that you can also do an interesting bakery tour upstairs and watch the bread being made. Locals love Philz coffee, apparently. They have really unique coffee drinks as well as fun, somewhat more traditional blends. I had a Strawberry Matcha Latte (with Boba) from Boba Guys and it did not disappoint. I insisted upon making this our first stop in San Francisco, literally after we dropped our bags off at Hotel Zelos. Paul had the Dirty Horchata and loved it as well. I wish we had stopped here multiples times. Bourbon + Branch is a speakeasy cocktail bar. You need a secret password to get in. Make reservations here beforehand. Fun tip, there is another secret speakeasy INSIDE of Bourbon + Branch that we didn't know about until it was too late to make reservations...it sounds REALLY cool so make reservations there too! This hotel bar is on the top level of the swanky Omni hotel with AMAZING views of downtown San Francisco. We went on Sunday night and were seated in the bar right next to the window. I was mesmerized by the view for hours. As previously mentioned, our first night there, we opted to stay in at our hotel bar, Dirty Habit, and had dinner, apps, and drinks here. They had fun cocktails and really good plates to share. If you're located near Union Square, it's a perfect place to start or end your night. The Buena Vista Cafe is the absolute coziest place, we had delicious Irish Coffees (and a show) here. The tour takes approximately 6 hours but of course, can take shorter or longer depending on your needs. I found that I was having so much fun and excited to be seeing so much in one day, I was energized to keep exploring! I began to crash near the end but we were so proud of what we accomplished. The tour begins near The Ferry Building and ends at Union Square. The tour starts at the Ferry Building. In order to speed up the non-essential parts of this tour, we took the BART to the Embarcadero station. After getting off the Bart and walking towards the Ferry Building, we stopped at Philz Coffee to fuel up before hitting the Ferry Building and exploring the Farmer's Market. We stopped here for a bit to listen to the live music and enjoy the scenes. It was a REALLY nice stop and if you happen to be in San Francisco on one of the days where the Farmer's Market is running, definitely visit for a bit. There are some famous spots for food and drink in the Ferry Building, Cowgirl Creamery being one of them. We didn't try anything from here, but it looked really good! We had a shared meal at the taco station called Primavera, a Mexican breakfast place that I definitely recommend trying. 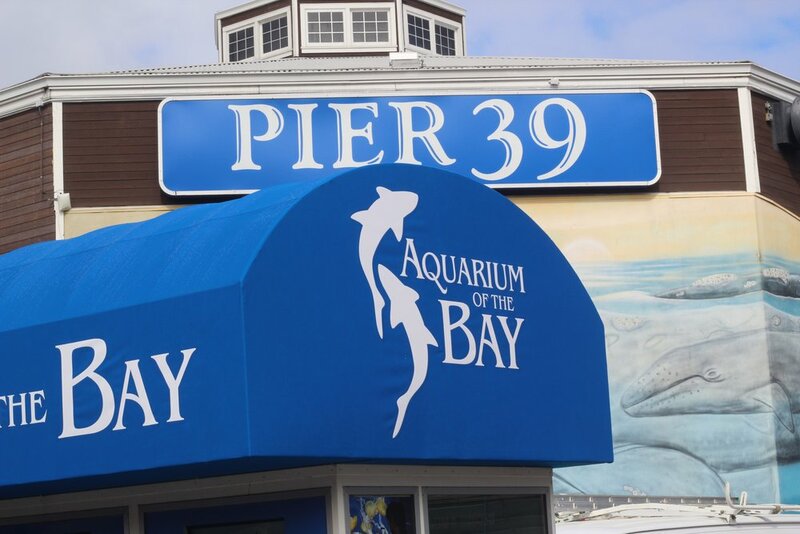 Pier 39 is the next stop on the walking tour. To get here, exit the ferry building and turn right and walk down the Embarcadero. There are definitely some characters to see on this street! Keep walking until you reach Pier 39 with loads of tourists and the famous Sea Lions! Plenty of touristy attractions here- a Hard Rock Cafe, an Aquarium, Bubba Gump, etc. We skipped these tourists spots and walked through to the Sea Lion viewing area. They are really cute!! I was surprised at how enjoyable this part was. Definitely worth a view. You aren't going to find any San Francisco locals here, but for a first timer in town, I think these touristy stops are absolutely necessary! Continue walking in the same direction (North) down the Embarcadero. In a few minutes you will be at Fisherman's Wharf. This is another touristy hot spot- but there are some can't miss things here! There is a fun penny arcade/museum called Musee Mechanique that we stopped at, just to walk through it. This is also where the famous Boudin Bakery is, a great place for Sourdough bread bowls and New England Clam Chowder Soup. If you continue walking this route, eventually you'll reach Ghiradelli Square. There are a lot of fun things around here. Before we reached the square, we stopped at The Buena Vista Cafe, the inventors of Irish coffee. Watching the bartenders make the Irish coffee is truly a (messy) art. We stayed here for a bit and enjoyed our drinks, then headed up the block to Ghiradelli square. We actually had been to Ghiradelli Square the previous evening, where we did some quick exploration and stopped in to a winery store to sample some wines. We actually spent over an hour in the winery having fun with staff and talking to locals- and ended up buying a case of wine to be shipped home (whoops)! Because it was our second visit to Ghiradelli Square, we just did a quick walk through and tried some chocolate samples. They supposedly have amazing desserts here if you're into Chocolate Sundaes and that sort of thing! The Russian Hill neighborhood is up next and oh man you guys, prepare for some HILLZ. This neighborhood is hilly AF and your legs will be BURNING, I can almost guarantee that. Walk East on North Point and make a right on Hyde street. Continue on this street until you reach the iconic Lombard Street. The views from this street are really cool, and the views from the bottom looking up are interesting too! It's sort of just a "go and look at it" type stop, then you can move on. It's pretty, but not too much to it. We headed towards Little Italy from Lombard Street and spent a few minutes sitting in The Park on Washington Square. We didn't make any stops in Little Italy, but if we had, I would have tried the Tiramisu! We headed to Chinatown, which is right near Little Italy. We stopped at a restaurant here to try some Chinese food. There's a lot to take in, in this neighborhood. Just soak it up and enjoy wandering down random streets and side streets. We headed to Union Square and this was luckily, where we were staying. I was pretty happy about staying right downtown (for like the millionth time this trip) and we made a quick stop at Macys before heading back to our hotel. I do want to be upfront with you all, and share that this walking tour is INTENSE, and packed. There were definite moments in Russian Hill after scaling this giant mountain that I was not feeling it. I persevered though, and it was all worth it. Feel free to skip any neighborhoods or sites that don't sound particularly appealing to you. This tour worked our perfectly for us and it allowed us to quickly and efficiently hit all the spots on my San Francisco Itinerary! We did this tour on Saturday. On Sunday, we headed to Alamo Square to view the pretty Painted Ladies, the iconic SF rainbow colored houses, and then headed to Crissy Field to take in some views of Golden Gate Bridge. Sunday was a lot more relaxed for us, and we headed to the Omni later in the evening for drinks after taking the California Cable Car line to get there! Definitely ride a Cable Car in SF. It's not always the most efficient mode of transportation, but hanging off the side and holding on for dear life is SO much fun!! Especially up and down the hilly streets. I hope you find this guide useful and enjoy San Francisco! I absolutely love it there and am looking forward to returning in the near future. Have you ever been? What was your experience like? Wine tours are traditionally reserved for warm summer months, but every winter, without fail, we start jonesing for a wine tour around the Finger Lakes. One of the (very) few perks of enduring harsh upstate winters, is that we are a short 40 minute drive to wine country. The best thing about doing a wine tour this way, is that there is ZERO planning required. For this weekend, we decided the night before that it would be a fun way to spend a wintery Saturday. We picked Seneca because it's the closest lake and that was it for planning. We typically start at the top of the lake, work our way down on the eastern side and make it as far back up on the western side as we can, before wineries close. The Finger Lake Wineries also have fun weekend events scattered throughout February and March, like Pasta and Wine weekend, where each participating winery gives you wine samples along with various interesting pasta samples (my past favorites were a lasagna and a chocolate mac and cheese...amazing). Or the Chocolate and Wine Weekend, where unique creations using chocolate are paired with various, delicious wines. Definitely recommend both of these fun events if you can attend, but if not, DIY-ing your own tour can be fun, too. This wine tour was especially awesome because we took recommendations from the winery staff at each place we went, so our route ended up being directed entirely by local favorites and wine experts. A few of the winery stops were recommended by multiple staff at different wineries. Damiani was a standout, according to everyone we met. The other standout was Zugibe. We also got this enticing recommendation for a lunch spot, called FLX Wienery, on the southern tip of Seneca Lake, but we had already eaten a late lunch and it did not fit in with our route/timing. But this place sounded so unique and delicious, just check Yelp if you don't believe me! Gourmet Hot dogs, Hamburgers and Poutine. Enough said. Below is the route of our Wine Tour on Seneca Lake, along with my thoughts and reflections on each winery. We started at Ventosa Vineyards, which we usually miss because they haven't participated in the themed weekends in previous years, so we were excited to stop here. This ended up being the BEST decision ever, we got so many good recommendations and I couldn't get enough of the wine and the view. Ventosa was the first stop on the tour, it's at the Northeastern side of Seneca Lake. I love this winery and their red wines are particularly strong. Paul loves red wines, and so did our server here. Our guide focused on wineries with an amazing red wine game when giving us recommendations. The wine is top notch at Ventosa and so is the service. Definitely recommend stopping here. It was a calm, serene stop and the staff were so friendly and eager to talk to us about the wines, and anything. They have great semi-dry whites too. This is a popular spot for weddings in the summer. Our next stop on the wine tour was Zugibe, and we were SO excited about the wines here. They lived up to the hype for sure. Our tasting here was a nice and relaxing experience, it was just us and one other couple in the tasting room. The dry reds at Zugibe were really, really good. There was nothing too sweet on the menu, even the whites were dry and delicious. Considering neither of us like anything too sweet these days, the wines were perfect for us. I only tried one white wine here, because I didn't want to miss out on any reds. Try the Fred's Red and the the Phonetician blend. The Lemberger was on point as well. They have a really pretty outdoor area, with cute little tables and a perfect Summer view. I'd love to go back in the Summer, sit outside, with a glass of wine in hand and enjoy the fresh air. Friendly staff here as well. We loved this stop, and it is definitely a necessary stop on any Seneca Lake Wine Tour. We bought a few bottles at this winery because we loved the reds so much. I enjoyed the white wines we tried here as well. We had such a fun experience, this place probably wins the overall experience medal in my book. The wine experts here were a couple, and they were SO friendly and fun. We were the only ones in here so we got extra special attention and there was no shortage of wine flowing. Such a fun place and a great stop for your wine tour. Wagner Vineyards Estate Winery was a super-quick stop for us, unfortunately. Wineries close at 5pm and this was something that hadn't occured to us until we arrived here at 4:30 and she told us last tastings would be at 5. They have a brewery here for beer tastings, too. We enjoyed the wines, although spent the shortest time here because we didn't want to miss Damiani! Not after everyone had raved about it. What stood out here was our friendly server. He was enjoying telling us the history and tons of info about the wines, which I normally love, but I felt too rushed to soak it in. Worth a stop and if I were to go back, I would stay longer, and also try the beer tasting they have available. Damiani Wine Cellars was our final stop on our wine tour, and the red wines here are definitely the best of the best. Every single wine that we tasted here, was amazing. We stayed well past closing hours and continued to milk our samples for all they were worth. We bought two different bottles here, Pinot Noir and Cab Franc, and I cannot wait to crack those open. This is a must stop on any Seneca Wine Tour!! Just plan your time better than we did so you can stay longer, and really enjoy everything the Seneca Lake wineries have to offer. The best tips I can give you is to plan the route, and pick the wineries ahead of time where you want to stop. If you don't, you'll end up visiting too many mediocre wineries (we have in the past) where sample sizes are subpar and wine is sickly sweet. Add my recommendations to your itinerary and you will absolutely have a solid start. Also, keep in mind wineries close early! So start your day earlier than we did (we started at like 1pm). What I would do, if we were to re-create this tour, would be to skip lunch beforehand, and instead plan to have our main meal at FLX Weinery. Have you been to the Finger Lakes?? They are worth a visit if you're in the Upstate NY area! What are your favorite wineries on Seneca Lake, if you've been? Tell me in the comments! When I was living in Columbia, South Carolina, I took every opportunity to make weekend trips to the surrounding cities. I love the road trip options near central South Carolina, and one of my very favorites is Charleston. I always though no city could ever top Charleston, but after visiting Savannah, I had a change of heart. Savannah may be small, but it certainly doesn't feel small. It has a top notch restaurant scene, interesting tours, and friendly people. An extended weekend in Savannah is hardly enough (seriously! Paul was so in love he said he could easily live there) but if it's all you have, here are the top things to experience. During our weekend trip to Savannah, we stayed downtown right in the heart of the historic district. We were close to all the monuments, tours, and restaurants we wanted to visit. In fact, our hotel was right next to the Olde Pink House, my absolute favorite restaurant in Savannah. Our location was so convenient, that we could walk to nearly everything we did in Savannah. We found a parking spot (parking downtown is notoriously annoying) and left the car there all weekend. Uber rides are an easy, affordable option for getting around, but we mainly walked unless it was late or we were tired. We stayed here and loved the location, the wine and cheese happy hour, and friendly staff. I found our Inn last minute on Hotel Tonight and it turned out to be the perfect choice for our weekend getaway. Collins Quarter was our first activity and the very first meal we had in Savannah. The brunch there was my favorite. I had the Eggs Benedict (which I don't even usually like) and it was amazing! The food was so, so good. Collins Quarter is extremely busy and popular so just expect to wait for a while. It is totally worth the wait! Have a coffee cocktail at the walk-up window outside or stroll the pretty surrounding street while you wait. At the walk up bar window outside, I ordered a Lavendar Mocha and it was one of the best coffee drinks I've ever had! River Street is like the Bourbon Street of Savannah. Rowdy, bustling and extremely fun!! It's also very touristy. I'm cool with touristy though. We had so much fun stopping in the various shops, buying some souveneirs and T-shirts (we bought matching ones!) and listening to the plethora of live music. I'm all about the vibes at River Street. Definitely a must visit in Savannah, especially on a short trip! We were only a few blocks away from here so we walked to River Street, drank street beer (you can walk around with open containers in certain parts of the historic district) and just soaked it all up. The whole River Street experience is a bit comical too, just be prepared for it. We did a hop-on, hop-off trolley tour of downtown Savannah. It goes everywhere and was highly entertaining. It's a good way to see the entire historic district, just don't expect to use it as effective transportation. The entire tour is LONG so definitely hop off if you come to an area that you are hoping to explore. We did an Olde Town Trolley Tour and it was great, there are tons of companies available though. We hopped off to stop for Brunch, then hopped back on near River Street to finish up the tour. Definitely book a ghost tour while you're in town. Savannah is known as the most haunted city in America, for goodness sake! We did the Patrick Burns ghost tour. Paul thought some of the "ghost hunting" equipment was cheesy, but the stories will shake you to your very core (I'm not kidding you guys, I got VERY scared and freaked our during one of the stops on our tour. I almost grabbed Paul and insisted we leave). I cannot properly exress to you just how CREEPY Savannah's ghosts are. At one of the houses, Patrick told us a story about a man who died in the house, was said to haunt it and watch people from the window. He explained how previous ghost hunters had seen a creepy face staring out the window, at times. During the entire time that we were in front of that house, I kept getting a feeling I was being watched. I could NOT get away from that house quick enough and this was the stop (one of the first ones on the tour!) where I nearly quit the tour. I persevered, and it was awesome and creepy AF. Totally recommend. I love this boutique/specialty coffee shop fusion. I made multiple trips to the Paris Market while in town. I bought a bag of lavender (because, doesn't that seem Parisian and luxurious), a pretty scarf, and some gorgeous postcards that I intend to frame. The coffee is delicious and interesting. I had a white Chocolate Rasberry drink and Paul had coffee from a French Press. Read more about the Paris Market and other coffee shops to try in Savannah here. Enjoy cocktails, appetizers and entrees at this amazing restaurant downtown. This is my favorite restaurant in Savannah and best overall dining experience too. From start to finish, the meal was award-winning. Go down to the basement, (its sort of like a chic, beautiful, dungeon) and have your meal down there, or sit at the bar. This is just one of the coolest, most romantic restaurants I've ever been to. It would also be perfect for drinks with the girls!! They have really unique menu items, too. I recommend skipping Yelp and asking the bartenders for recommendations. Everything our bartender suggested to us was mind-blowingly on point. I am totally obsessed with this place. Loved the Fried Green Tomatoes, BLT salad, and Shrimp and Grits. We even got dessert. Have you been to Savannah? Do you love it there? What did you do while in Savannah?? We recently spent five glorious days in Punta Cana, Dominican Republic and it was such a beautiful getaway, during these chilly January months in Upstate NY. We stayed at an all-inclusive resort right on Bavaro Beach. I've never stayed at an all-inclusive before, and it was such an interesting experience! I wanted to share some thoughts on Punta Cana, general thoughts on staying at an all-inclusive, and what we learned from our quick vacation. Punta Cana is so gorgeous, and you will quickly find once you start researching your trip, that it is the land of all-inclusives. I think nearly all of the hotels we found, while we were searching for accommodations were all-inclusive. I can only surmise that this is for a reason, and that Punta Cana is one of the places where they want you to stay on the resort. It is typically okay to venture off for excursions through local companies or your hotel, but for the most part, wandering the streets is likely not a safe option. When we first arrived in Punta Cana, we headed straight for the pool to squeeze in 45 minutes of fun before pool/pool bar closing time. We met this lovely couple from Boston and became fast friends. One of the first things they mentioned to us, was that they frequently stay at all-inclusives, but love to venture out in whatever city they were visiting. They had friends from home that had recommended they stay on resort property. We took that advice as well. Paul is the type that loves to wander the streets, interact with locals and try local cuisine. I totally love these things too when traveling, and that was the biggest missing aspect of staying at an all-inclusive. Additionally, there are so many things to navigate when staying at an all-inclusive, at the least at the big resorts. Figuring out where to eat, which restaurants need reservations, which restaurants cost extra, which drinks are not too sugary sweet, which drinks are the most value for your money, and where the worthwhile activities are is an enormous job. The resort we stayed at was huge, and there were various hotels within the resort, all with their own restaurants, pools, and activities. Frankly, we found the process of navigating an all-inclusive for the first time, very overwhelming. By the end of our stay, we had started to get the hang of things and figure out what was what. It was definitely fun and a totally new experience. We LOVED being able to order multiple entrees per person at the restaurants and multiple appetizers just to try to everything. I've been on a few cruises in my life and I would equate an all-inclusive resort to a cruise ship on land. What do you guys think about them? Although there were various restaurants (Thai, French, Dominican, Greek, etc) I still love the variety and authenticity of being able to eat Dominican food in restaurants with actual Dominicans. If you follow along on Instagram, I think you can see my love of swimming, beach time, and pool time. That is where we spent the majority of our time. Unfortunately, we had limited nice weather while we were there (it rained one entire day) so I wanted to maximize our sunlight hours. We finally decided on an excursion that involved snorkeling, swimming, a catamaran and a picnic lunch that sounded perfect, but the company was closed the days we were in Punta Cana due to unpredictable weather. This excursion also came highly recommended from our Boston friends. On the non-stop rainy day, our Boston friends left at 6am for a ziplining excursion that sounded like fun. We hemmed and hawed too long to commit in time to doing this, since I've been ziplining before, but if you never have been, it's definitely a worthwhile experience to try! We had a really great time in Punta Cana, and we both agreed we wish our stay was just a tad longer! Stay for a week if you can and really try to experience all the beauty, beaches, and activities that Punta Cana has to offer! Anyone been? Do you guys agree about the all-inclusive experience? or are you die-hard all-inclusive stayers? Tell me in the comments! I'd love to hear any new travel recommendations too! Have you ever stayed at a punta cana all-inclusive? or anywhere? PS- we got upgraded to first class on our long flight from NYC to Punta Cana! It was the absolute best (and my first time ever in first class)! Paul gets upgraded frequently but since we booked under him, we both did! Definitely got the vacation off to a festive start. Related: Check out some dreamy domestic travel destinations here and here!! I LOVE traveling. What I don't love is the "getting there" part. If I could just teleport to my final destinations, that would be ideal. But since this is obviously not possible, I like to travel as comfortably as possible and pack all the things I could possible need or want in my carry on. There's nothing worse than being stuck on a long flight and realizing you are missing something essential for your comfort, like a neck pillow or lotion for your alligator hands. These are some of the things that I love for long flights, and a lot of them feel like necessities. These airplane essentials for glamorous travel all happen to be pink, because,why not?! Cute AND functional, win-win!! 1. I love a good functional and pretty neck pillow like this one. 2. This airplane cocktail kit is the cutest! Of course its created by Gray Malin, one of my favorite photographers! 3. I love passport cases. I own multiple ones and this case is getting added asap! 4. For the airplane movie or listening to music, obviously you need these. 5. You're stuck on a plane for a few hours. Might as well learn something and read this gorgeous masterpiece of a book. 6. This has been a staple in my life since high school. It's the best. Great for moisturizing dry airplane lips. 7. If you're like me and you have Alligator hands all year round, especially while flying, moisturize your hands with this. 8. These pretty sunglasses will do the trick (especially if you're headed someplace tropical) and allow you to totally nail that whole glam gal vibe! If you have to spend a few hours on a plane, might as well look good doing it! Travel in style with these airplane necessities. What are your travel must-haves?? Tell me in the comments! I am so excited to share my extended weekend Guide to Asheville, North Carolina! We had so much fun spending a (chilly) November weekend in this stunning mountain town. We crammed a lot of activities into 2.5 days there. I have so many lovely things to say about this town. This city truly has something for everyone, whether you enjoy indoor vacation getaways spent restaurant and bar hopping, outdoorsy weekends doing sporty activities and hikes, shopping in eclectic boutiques or a mix of all! If you're lucky enough to visit this gem of a southern town, I hope these tips will help you make the most of your days there! Mid Range Hotel (a few hundred dollars)--Several previous visitors recommended Aloft Hotel in downtown Asheville. It's stylish and modern. We wanted something more authentic and rustic, but this hotel is a great option for those wanting to be right in the heart of downtown Asheville! The only experience we had here was meeting outside for our Pubcycle tour, and waiting inside the warm lobby when temperatures dropped later on in the evening. it definitely seemed like a funky, fun place to stay. High Roller Hotel (several hundred dollars/depends when you go)--stay at The Omni Grove Park Inn--just google it. It looks out of this world rustic, cozy and dreamy. We contemplated staying here for a one night splurge and enjoying the spa, but we ultimately decided it just wasn't in our budget and we would rather spend the money on activities. We chose this at the very last minute (we booked it the same day as the tour) and just lucked out that there were seats! I've done a pedal tour before in Nashville, and it was one of my favorite activities there, so I figured it would be fun in Asheville too. The Pubcycle tour did not disappoint. We were greeted by a tour guide (in a costume?) he was hearing a fun, funky outfit topped off with a very furry trapper hat. He kept us entertained and laughing from start to finish. The city tour option that we chose was 90 minutes and stopped at two breweries/ bars. The stops are quick so order quick shots or small easy to drink beers/mixed drinks. You get about 15 minutes at each stop (unless you're late to your return time like our entire group, and your tour guide has to come in and drag you out...in that case, you get longer). It's a fun, relaxing way to see the town, listen to some music and experience a few of their famous breweries. Drive along the Blue Ridge Parkway and get out at the various stops to hike, see waterfalls, and admire mountain views. Instead of the Blue Ridge Parkway, we opted for a neighborhood hike with mountain views because of the cold weather. We also wanted to avoid driving. Next visit, will definitely try to see some of the famous waterfalls and make the picturesque drive along the Blue Ridge. Sooooo, I have a lot to say about this place. Treat it like Disneyworld, I read. Expect to have a long day on your feet and be tired by the end. Theres a lot of walking and the place is HUGE. They shuttle you from the parking lot to the Estate, but there still is a good bit of walking. The house is gorgeous, reminds me of Versaille outside of Paris. Pay extra for the self guided audio tour (we did not and I totally regretted it). I know it's tempting, after paying the 70 bucks (yep) just to enter the grounds, but without the audio tour, you're just looking at pretty rooms. We kept hearing tidbits from other tour groups and those were the few fun facts I learned about the Vanderbilts. The gardens were my favorite part of the house. Very pretty. However, my absolute favorite part of the entire Biltmore Estate was the Winery. Our sommelier? said "we recommend ordering 5-6 samples, they all begin to blend together after that." yeah, right. It is essentially an unlimited wine tasting, and after spending the 70 dollars to enter, we felt that unlimited was earned. We spent over an hour at the wine tasting, and had about 8-9 samples each. The wines were very good, especially enjoyed the "Christmas at Biltmore" Red wine. After wine tasting, we headed to the pub on the grounds. Enjoyed the food and service here very much. The area around the winery looks similar to Biltmore Village, very European inspired and whimsical. There's a creamery and little gift shops and such, too. Downtown Asheville is where we did most of our shopping. We stopped at cute boutiques and whatever caught our eye as we explored the streets. My favorite boutique where I originally picked up about 7 items to buy, was called Duncan & York. I wanted everything. Pretty cards, cute gifts, Anthropologie-esque vibes...you will love it. Also, stop at Asheville Bee Charmer and sample the honey! and then buy the honey because it's delicious and you will want to. I bought a spicy Ginger Honey (I'm obsessed with ginger AND honey for DIY cold and flu remedies), so this was perfect for me. One cold afternoon, we grew tired of being out in the cold. We wanted a space to warm up and chat. As we were passing Dobra Tea, I suggested we check it out. Again, so glad we did. It feels very exotic and peaceful in there. You sit down and are given a tea book with (hundreds) of options. The tea experts are also very helpful and can guide you in the right direction. It was a truly lovely way to spend a few hours, and the tea was a perfect blend of lemongrass and Ginger (they offer Matcha cakes and interesting snacks, too)! The Salt cave is a MUST STOP you guys. Truly. It is SO relaxing, peaceful and unique! I've never done anything like it. You basically go into this cave-like room with Salt surrounding you on all sides. There are comfy chairs and floor setups. We were the only two in the 4pm session so we had the cave to ourselves. I fell asleep almost immediately after she offered us a guided meditation to get the relaxation started. They warn you that you may experience increased coughing after the session (it is supposed to totally heal your respiratory system- she told us an anecdote about TB in Europe and how workers in the Salt Mines were miraculously spared from widespread disease). We did not experience any increased coughing. It was such a fun experience, and if I lived in or near Asheville, I would return at least once a month! Sessions are 45 minutes, and my only complaint is that I wish they were three hours long. A staple in the West Asheville scene, Sunny Point Cafe felt like a must-try spot. The local love for this place can be felt as soon as you spot this charming, brightly decorated, beloved spot. The wait for brunch was well over an hour, and the garden adjacent to the restaurant was PACKED of bundled up, West Ashevillians waiting to dine there. We knew it would be good. It was. We shared the Brunch Burger and the Huevos Rancheros and also sipped on some brunch cocktails. In order to maximize our stomachs, time, and experiences, we ordered small plates at each of these and sampled lots of different things. We tackled both of these in one night because they are almost right next to each other. The wait for a table at Curate was just enough time to grab an appetizer (AMAZING meatballs) and yummy fancy cocktails at Rhubarb. Very convenient. At Curate, we split the lamb skewers, chicken fritters, and the octopus. They were all very interesting, but the meatballs at Rhubarb were my favorite appetizer of the night. An old timey bookstore with Champagne, Cheese, and rows and rows of interesting books. It's very parisian. They have a wide range of champagne cocktails, the cheese plate was very enjoyable. Come here for a date night, friend dates, happy hour, and pretty much any other occasion too! This was the shortest we waited for any restaurant the whole time. We were seated immediately and had my favorite brunch in Asheville here. Our meals were lunch based. The sandwiches are really good, tried both the Fried Chicken BLT and the Cheesy Grill. Phenom. The Spicy Margarita was perfect, too. Obama loves this place. Enough said. Lunch here was perfect, and close to the Biltmore. The Reuben is award winning, and obviously we had to try that. We also split the black bean burger. Both were winners in my book. They had a spiked coffee drink with whipped cream, baileys and a sea salt rim. I finished it within minutes. Limones was not on the original itinerary but after a Salt Cave session, it was too convenient (right across the street) to pass up. Ordered various appetizers like the Ceviche platter and Lobster Nachos, and (strong) cocktails. Enjoyed everything. Definitely a necessary stop. A cool, speakeasy type cocktail bar. Cocktails are strong and tasty. We also had the Crispy Brussel Sprouts which were BOMB. We tried dessert there too, it was not a traditional cupcake like we were expecting but still tasty. I hope you find this weekend guide to Asheville, North Carolina helpful!! It really is a unique, eclectic, funky, interesting city that should be a must on anyone's travel bucket list! I cannot wait to return, hopefully in warmer weather someday. Anyone else visit Asheville and fall in love with it?? My weekend in Savannah was one of my favorite weekends I've had since moving to the South. I've been in absolute, head over heels, love with Charleston for a few years now, and Savannah fell by the wayside in my mind. Boy, did I have it wrong. Savannah is gorgeous, perfectly preserved, full of gorgeous tree-lined streets and fun, cutting edge restaurants. Three days in Savannah was all it took for the historical city to become an instant favorite. We only had three days to spend in the dream city, albeit activity PACKED days. With so much on the itinerary, we obviously needed to start each day supercharged, via caffeine. You cannot go wrong with any of these coffee spots, whether you're a caffeine addict like Paul, or, like me, you just love the activity, cozy atmosphere and company of coffee runs. This place had a line out the door all the way to sidewalk. We almost gave up upon walking up and seeing that but we persevered. I'm so pleased we did. The Mexican Mocha that I ordered was spicy, deliciousness in a cup. Their drink menu is creative, extensive and original. Not to mention the vibes inside the shop are super eclectic cool. We also split the Czech pastry that they make fresh daily, made in their sister bakery nearby. So good. I think I stopped by this boutique at least once each day. I could not get enough of the chic Parisien atmosphere and bought various candles, matches, scarves and postcards each time we stopped there. On our final morning, I ordered a special White Chocolate and Rasberry Cafe Latte that was out of this world good. Paul ordered an even fancier drink than mine that came with an actual French Press. While waiting for our table, we walked past the walk up coffee window at The Collins Quarter. As a total last minute decision, we could not resist the cute window and ordered coffees. This was actually my favorite coffee drink that I had in Savannah, I ordered their signature Lavendar Cafe Latte. It did not disappoint.